One look at the top food tech trends in 2018 and you’ll think your dinner came straight out of the Jetsons or the Flintstones. On one end the of the spectrum, you have the get-back-to-the-cave movement with simple paleo diets. And on the other end of the spectrum, you might feel that you took a time machine to the future where robots prepare your meal. It’s like the mad scientists and artists got together to cook dinner in a petri dish. It’s no longer just an art. It’s also a science. Check out 5 of the weirdest foods you should expect to see coming straight out of Israel and on to your plate. But it’s not a joke. The statement might even be downright offensive to other cultures. The practice of entomophagy or insects as food is common in parts of Central America, South America, Africa, and Southeast Asia. If you’ve had any desserts dyed red, you’ve probably eaten bugs in the West too. The cochineal insect has long-since been used to dye foods and cosmetics in the West. 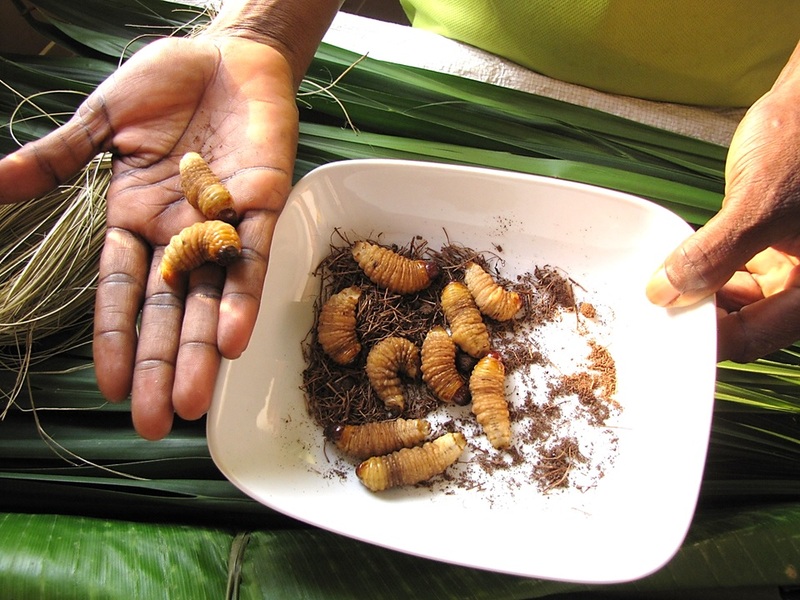 Now Western entrepreneurs are exploring insect protein options for nutrition. Israeli entrepreneur Eran Gronich founded FlyingSpArk in order to address impending food shortages and other environmental concerns. He has come up with an alternative protein by grinding down fruit fly larva. Gronich attests that the powder is healthy, sustainable, and has a long shelf life. You can add it to your shake, fry it up, or bake bread. You’ll just have to get over the ick factor. But not everyone is grossed out. IKEA is completely onboard. Soon, they’ll be serving up the bugs around the world. As they say on the website, “if you can’t beat them, eat them!”. If you are still feeling adventurous, how about adding a little grasshopper protein to your shake? Another Israeli company is also out to take a potential food crisis head-on. Hargol FoodTech supplies an earthy powder made from sustainably harvested ground grasshoppers. The company advertises that it has a 70% protein content and other mega nutrients. It’s also deemed kosher and halal, but that’s up for debate. You know the saying, “2 Jews, 3 opinions.” They have won 10 innovation competitions since their inception in 2014. Moreover, they have received $5M in orders from notable companies like Whole Foods, IKEA, Guinness Stout–among others. They are well on their way to be the next superfood craze if you can get past the whole eatings bugs thing. 2. Would you like fries with that? If you love burgers, but you want to give it up for your health or due to environmental or ethical concerns, you don’t have to feel like you are missing out. Impossible Foods has made the impossible possible in Silicon Valley. Stanford biochemistry professor Patrick O. Brown, vegan Israeli chef Tal Ronnen, and Boston cheese maker Monte Casino put their heads together to make a meatier plant-based burger. It can even sizzle, crackle, and “bleed” thanks to the addition of heme, an iron-containing molecule that is found in plants and animals. Go ahead and slap the patties on the grill at your next barbeque. No one will know the difference. Do you want to eat meat without slaughtering an animal? Well, science has a solution. They are now growing “cultured meat” or “clean meat” from animal cells in vitro. Industrialized livestock has reportedly wreaked havoc on the environment, including excessive gas emissions, water overconsumption, and land use. However “clean meat” innovators such as Israeli startup Future Meat Technologies believe that they have a sustainable solution. A few meat cells can theoretically produce an endless supply of meat. It’s like Amish friendship bread (made from a sourdough starter) for meat lovers. 3. Honey, check the printer. I think dinner is ready. 3D printing has come a long way since they were printing little plastic objects in the late 1980’s. You can print your clothing, musical instrument parts, jewelry, or a custom-made toy from plastic, metal, or other raw materials. More astonishing, scientists can now save lives with 3D printed organs. So it comes as no surprise that 3D printed food is now on the table. Welcome to the future of fine cuisine. A spinning plastic and metal device filled with sugar, chocolate, and other delicate powders spin out savory and sweet sculptures. Fresh ingredients can be loaded into the Foodini to make pizza, pasta, quiche, brownies. You name it, it can make it. Two Hebrew University professors, Prof. Oded Shoseyov, from the Robert H. Smith Institute of Plant Sciences and Genetics in Agriculture, and Prof. Ido Braslavsky, Director of the Inter-Faculty Biotechnology Program and Head of Bachelor of Science Program at the Institute of Biochemistry, Food Science, and Nutrition, are working on a technology for personalized calorie-free food made from nano-cellulose fiber. They are targeting the gluten-free, vegetarian, and vegan market now, however, they insist that the technology will improve the lives of people with living with diabetes and celiac disease as well. The possibilities are endless. If you want to try it out, you can always head to London and check out Food Ink’s pop up 3D restaurant. Everything is printed from the cutlery to the serving trays to the food you eat. It’s not quite for the mainstream yet, but it’s getting there.